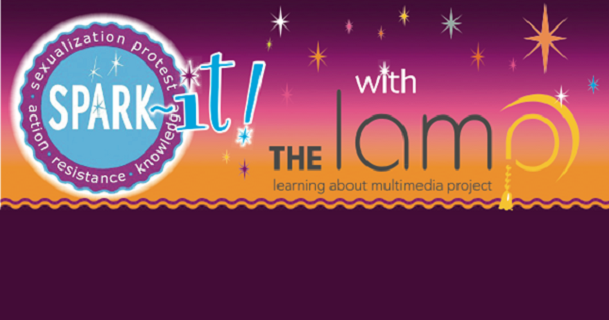 How many times have you seen a sexist or sexualized commercial and thought, “This so ticks me off, I’m not buying it, and I wish I could let them know why?” Welcome to our partner, The LAMP (Learning About Multimedia Project), a non-profit org with a mission to reform and improve media through education. The LAMP works with families, schools and communities to build healthy relationships with all forms of media. They offer workshops, public events for youth, parents and educators, and our fave, LAMPlatoon! LAMPlatoon is a program which allows you to put that offending commercial on notice by exposing the underlying stereotypes and talking back to the insulting messages. LAMPlatoon provides you with an easy (and completely legal) way to break down an ad, spoof, and critique marketing strategies used in media messages we see every day, and then share it for all to see. This SPARKit invites you to LAMPlatoon’s section on sexualized commercials, made especially for SPARK! If you’re tired of ads that deceive, objectify, and sexualize girls and women or trade on sexist, racist, and ethnic stereotypes, LAMPlatoon is your chance to fight back. So go ahead, put that ad on notice. Join the critical mass today. And let them know SPARK sent you!